It really is hard to believe that 10 years have gone by. And yet, no matter where you were in the world that day, the visual and emotional imprints as a result of what happened on 9/11 are as clear and strong as yesterday. Recently one morning, Joe, a transplant from New York now living in Florida, described in vivid detail his firsthand account of 9/11. He also reflected on a moment that occurred a week or so after the attacks. Joe and his partner Greg were in their apartment with the windows open. It was September, a Fall day after all, and there was a gentle breeze. 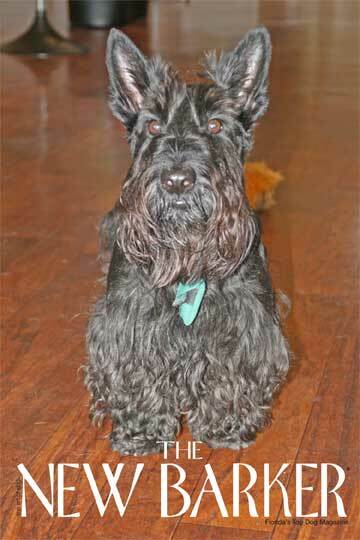 Max, their Scottish Terrier, ran to the window as it began to snow. But, it wasn’t snow. “The breeze had changed direction. It was ash coming from Ground Zero, blowing past our windows,” said Joe, still visibly affected by that moment in time. Anyone taking the time to read this blog is a dog lover. So you already know how dedicated dogs are to their human companions. Nothing illustrates this dedication more than those dogs (and their handlers for that matter) who were first responders to Ground Zero ten years ago. Search and Rescue Dogs, some trained to find survivors, others specifically trained to find the dead, dug in the toxic aftermath of 9/11. Some had their paws burned by the white-hot debris. 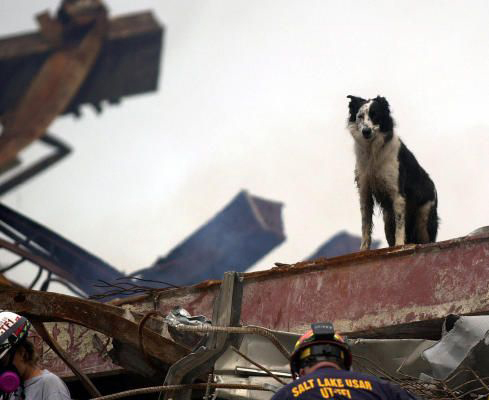 Search and Rescue Dog at Ground Zero. The American Kennel Club (AKC) was a first responder for those search and rescue dogs injured in the rescue efforts. They purchased and transported a portable x-ray machine and other medical equipment to lower Manhattan two days later. AKC supporters covered one hundred percent of the veterinary bills for those dogs injured while working the piles searching for survivors. This video from the AKC is a moving tribute of the heroic dogs of 9/11. In the days that followed 9/11, remember how as a nation, people started caring about their neighbors more? Remember how we said hello to strangers? We thought more about acts of kindness and paying it forward. Ten years later, September 11 has become a day of service. A day to volunteer. It might be a good day to consider visiting your local animal shelter with a simple donation of dog or cat food, towels or an offering of your time for just a few hours. The world continues to turn, and as we all go about our routines this weekend, most likely with our dogs, we’ll pause for a moment to remember. Whatever it is you’re doing this weekend, appreciate the moment: Life. Love. Dogs. Norine, that indeed is a fact, hard as it is to believe. The New Barker is honored to be a supporter of Retired K9 Heroes. We are co-hosting a benefit concert on October 22 at Ferg’s Bar & Grill, 1320 Central Avenue, St. Petersburg. Music by FME, Trenchfoot Shindig and Shoeless Soul. Come on out and support this organization. Hours: 7p ’til midnight. Yes this is a true. We are a non-profit that benefits retired police,fire, and search and rescue k9’s. You can check out our website at http://www.retiredk9heroes.org and on facebook at retired k9 heroes. The k9’s are helped through donations and fundraisers. Please help us support these great Heroes that have served you and I faithfully for many years. They deserve it! all of the dogs who searched for folks on 9/11 or any other time usually end up living out their lives after retirement with their beloved handlers. Guess what? the fire departments/police departments/sheriff’s departments/FEMA give those handlers NOTHING for the dog’s care after retirement. And as we all know, those vet bills can be expensive as our dogs get older. Please donate to “Retired K9 Heroes”, an organization devoted to helping those handlers pay for the cost of care for their retired search and rescue/police/detection dogs. For goodness sakes, these dogs have given everything they have to help humans…..the least we can do is help them as they live out their lives. Next Next post: September 16-23 Is Dog Restaurant Week.